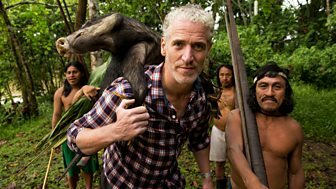 Gordon Buchanan travels to three remote tribes to learn the wildlife secrets of people who live alongside the iconic and dangerous animals we fear the most. A partnership between scientists and the Waorani has led to exciting new discoveries. Gordon Buchanan and the Tribes crew answered questions after the first UK transmission. The series director on bonding with the tribe through laughter and rituals. Penti, Chief of the Waorani village of Bameno, has a message for the outside world. "Musically the series presented itself with some interesting challenges." Living alongside the world's most dangerous animals.